It’s no surprise that someone who has dedicated their career to helping others find the perfect home is also passionate about our mission. When a house is in disrepair it becomes a barrier to health, happiness, or hope. Partnering with local real estate agencies creates opportunities for awareness, volunteering, and fundraising. Most importantly, we work together to make homes healthier. Don’t take it from us, take it from those who choose to partner with us and hear how others are advocating for safer, healthier, and more livable homes. We’ve teamed up with some of the agencies who work with us to share about why working with Rebuild Upstate is important. The GGAR supports Rebuild Upstate through volunteering, awareness, and donations. In 2017, GGAR donated over $1,000 in gifts cards to Rebuild Upstate that supported materials for local projects. In 2017, GGAR members teamed up to build a ramp for a local veteran and his wife who needed a safer way in and out of their home. Thanks for all you do, Greater Greenville Association of REALTORS®! Why are you passionate about Rebuild Upstate? I love Rebuild’s mission of restoring dignity in the homes of the disabled, low-income, and elderly in Upstate SC. Home is such an important place for people; a place where many find comfort and solace. Restoring a home to a safe and liveable condition not only provides hope and happiness to families but also eliminates the need for additional affordable housing units which are difficult to obtain. I love that Rebuild uses the money that is donated to them wisely and efficiently to help the most families they can! How are you looking forward to partnering with Rebuild Upstate this year? I am so excited to become more involved in Rebuild Upstate this year! In addition to being on the Advisory Council, I am a voice in our community advocating for Rebuild and enlisting the help of volunteers. This year RE/MAX Moves will participate in two projects, one in Simpsonville and one in Greer, where we have our two offices. In addition, I have enlisted the support from my friends in my Pacesetters group, a Pulse Young Professionals group through the Greenville Chamber of Commerce. My hope is that the word will be spread through my co-workers and friends and that Rebuild will gain even more volunteers and donations this year! Why are you passionate about Rebuild Upstate? I love working with Rebuild Upstate because helping those in need is what life is all about! Since I have a builder background, I feel that it is my duty to give back with the gift I was given. However, above all other reasons, the smiles on the faces of those being helped and those helping is priceless. How are you looking forward to partnering with Rebuild Upstate this year? I personally partner up with Rebuild Upstate a couple times per month to help out with initial visits which aid in determining the level of work needed to get the home fixed. I also try to take part in the construction project themselves whenever possible. BlackStream volunteers with Rebuild Upstate at least twice a year. Recently, BlackStream Christie’s hosted a fundraiser for Rebuild Upstate the night they celebrated the ribbon cutting of their new office. They raised $1,200 for Rebuild Upstate that will support a project for a local homeowner. BlackStream has also volunteered with Rebuild Upstate. In addition to group volunteering and events, individuals are represented on Rebuild Upstate’s advisory council. Their goal is to raise $427 more before their upcoming volunteer day to fund an entire project. Consider supporting BlackStream’s fundraising goal. Learn more about BlackStream International. Why are passionate about Rebuild Upstate? By volunteering with Rebuild Upstate you can see the immediate impact that a few simple home repairs can have on a family and their everyday lives. It’s wonderful knowing that you can make a tangible difference in a homeowner’s life while helping them stay in the home that they have built a lifetime of memories in rather than them worrying about losing their home. How are you partnering or looking forward to partnering with Rebuild Upstate this year? My goal as a volunteer and an advisory council member is to continue raising awareness and help increase the number of volunteer groups in the Upstate. The more people we have volunteering and the more money we raise, the more families we can help stay in their homes. I love working with Rebuild Upstate because they create an avenue for me to give back to the community in a way that I know will be meaningful and impactful to the ones who need it most. It feels great to do something that is really appreciated and with Rebuild Upstate I know my time and efforts are put to good use. My passion is driven even more by the opportunities to improve safety and value in the local community and perform community services relevant to my industry. The most rewarding part is when the homeowner thanks you personally for repairing and improving their home, which normally would have been unattainable if not for Rebuild Upstate. BlackStream has partnered with Rebuild Upstate in multiple instances. We have previously completed a team building deck project and are planning a ramp project as well as a bathroom demolition project for the future. We have also partnered with Rebuild Upstate for a fundraiser on our grand opening of new office downtown Greenville. Learn more about SVN BlackStream. 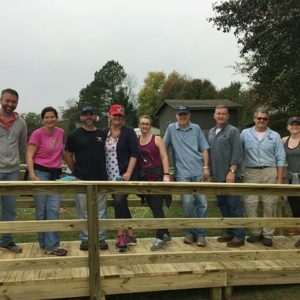 Berkshire Hathaway HomeServices C. Dan Joyner REALTORS® – Simpsonville Office has joined forces with Rebuild Upstate to assist them in raising funds for local community projects. Our agents also complete the project themselves with the help of a REBuild Site Manager. It is our agent’s firm belief that giving back to the community is a top priority. Our office wishes to complete at least one and possibly two projects in 2018 in the Simpsonville area. We will be grateful for any help you can provide. Help Berkshire Hathaway Home Services, C. Dan Joyner Realtors fundraise for Rebuild Upstate! They Gave Me Something No One Can Take Away – Hope.